Certain developments in gardens can be permitted development if they conform to the heights and distance from the boundary as specified in a Government publication. Such buildings should not exceed 50% of the garden area. 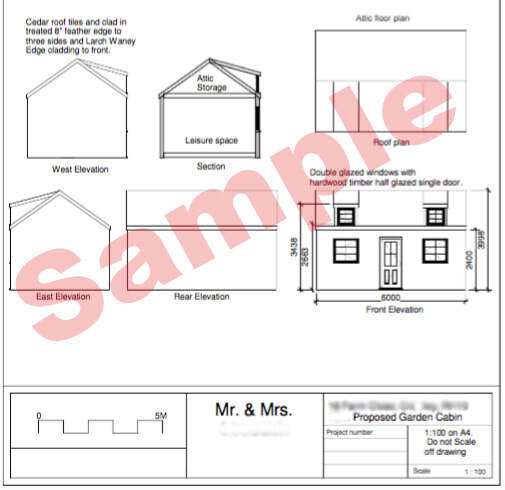 We do not give planning advice and you will, therefore, need to take independent advice on whether what you require is permitted development or not. One way of seeking guidance is to ask your local council. Often they have a duty planning officer who will look at a scheme and make an assessment based on the drawings and the garden area. Alternatively we can recommend a chartered surveyor and chartered town planner, Tony Bowhill, who can look at a scheme and assess its suitability for the particular site. There would be a fee, typically £250 plus VAT (20%). If a site visit is required then this will cost more. Fees will be agreed in advance with payment before work is undertaken. Tony can be contacted on Mob: 07885 892205. General rules for permitted development. Outbuildings and garages to be single storey with maximum eaves height of 2.5 meters and maximum overall height of four meters with a dual pitched roof or three meters for any other roof. Maximum height of 2.5 meters in the case of a building, enclosure or container within two meters of a boundary of the curtilage of the dwelling house. In National Parks, the Broads, Areas of Outstanding Natural Beauty and World Heritage Sites the maximum area to be covered by buildings, enclosures, containers and pools more than 20 meters from house to be limited to 10 square meters.